I love black beans. I may have a problem, an obsession you could even say. I used to think it was all beans because I buy a lot of kidney beans, small white beans and cannellini beans (Goya canned beans=yum), but I always end up cooking with the black beans. I have already posted two black bean recipes – black bean hummus and black bean burgers – and I have another one for you today. Every month, we get together with Mr. B’s childhood friends and their wives for dinner – each month its a different couple’s turn to pick a restaurant. It’s nice because we get to try a variety of Chicago-area restaurants and get to catch up with our friends at the same time. Back in January when we kicked this monthly dinner off, we went to a Cuban restaurant and I was seriously in black bean heaven. 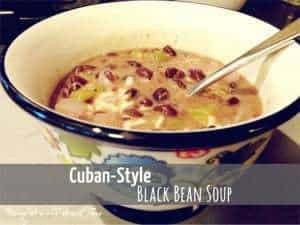 I had black bean soup and a heaping portion of refried black beans to go with my meal. I ended up eating only the soup and beans (and Mr. B’s beans) and took everything else home. (affiliate link) and made it into a soup. I added Chihuahua cheese on top for my bowl, but if you leave it out or use vegan cheese substitute, you have a great vegan dish. 1. In a large soup pot, heat the olive oil. Add the onions, green bell peppers, celery and garlic to the oil and cook over medium heat until the onions are translucent. 2. Add the beans, salt, bay leaf, cumin, oregano, and lemon juice and stir well. 3. Cover and simmer for 30 minutes, stirring occasionally to prevent sticking. 4. Add the vegetable broth and stir. When the broth begins to boil, turn the heat down and simmer for another 10 minutes. 5. Remove one cup of soup and pulse in a food processor 4-5 times. Return mixture to soup, stir and reheat to serving temperature. 6. If desired, serve with shredded cheese. In a large soup pot, heat the olive oil. Add the onions, green bell peppers, celery and garlic to the oil and cook over medium heat until the onions are translucent. Add the beans, salt, bay leaf, cumin, oregano, and lemon juice and stir well. Cover and simmer for 30 minutes, stirring occasionally to prevent sticking. Add the vegetable broth and stir. When the broth begins to boil, turn the heat down and simmer for another 10 minutes. Remove one cup of soup and pulse in a food processor 4-5 times. Return mixture to soup, stir and reheat to serving temperature. If desired, serve with shredded cheese. 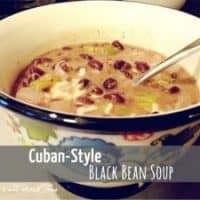 I’m going to keep trying to recreate the black bean soup from that restaurant, but in the meantime, this is going to be my new go-to black bean soup recipe.